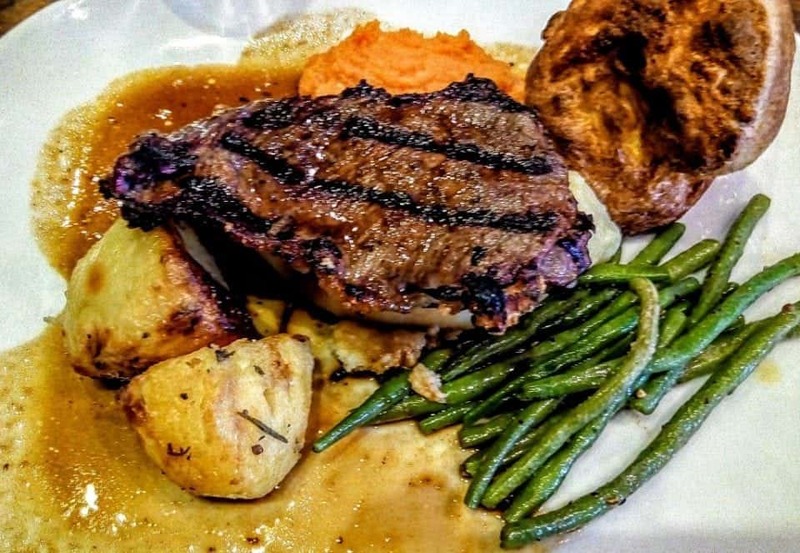 When I think of my favourite traditional English foods – things like fish and chips or a roast beef Sunday lunch come to mind but there are certain traditional British foods that make me smile because of the memories attached to them. The English had a reputation for some of the worst cooking in the world and my mother is proof of that. It used to be that the English boiled the crap out of everything and when it was served all the food was the same grey mess. And then there were those quirky British foods that defied explanation. British cuisine has come a long way in the past 30 years. Well, that was then and now England has a reputation for some of the finest foods in the world. However, there are some old favourites that the British cling to and rightly so. These are some of the top traditional British foods to try if you visit England. Many of you may already be a fan of some of these stalwart English traditional foods – I know my family can’t resist a Toad in the Hole. But, and there always is a but, England is also home to some of the weirdest foods many of which were my childhood favourites and some which I wouldn’t touch with a barge pole. So for your dining pleasure here is my list of the top 21 British Dishes you must try. English traditional foods can be – hmm – well shall we say unusual in other countries. For example in Canada we wouldn’t dream of trying a meat pie from a tin and when I mention Toad in the Hole to friends they give me that “oh no here comes some weird food” look. These are some pretty traditional foods in England. How many have you ever had? 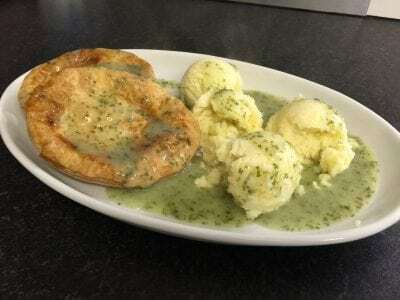 The following list of 21 traditional British foods may sound weird or unappetizing to those of you who haven’t been to England, but give them a try you never know you may just like them. 1 Paste: I know it doesn’t sound appetizing but I loved this stuff as a kid and I still slather it on toast or a sarnie when I need a comfort snack. They come in a variety of flavours: Sardine and Tomato, Salmon, Bloater and a few others these are my favourites though. This is the dictionary definition of English Paste. 2 Pie in a tin, specifically Fray Bentos Steak and Kidney pie. Lever off the lid and pop this into the oven and it doesn’t look too bad once the pastry crust starts to fluff and turn golden. However, upon its release from the oven and an attempt to serve on a plate, all your illusions of lovely steak and kidney turn to ashes because there really isn’t any in this pie merely some gluey gravy, nasty slimy undercooked pastry and tiny little pieces of some kind of meat. Exactly what I remembered. an orangey skin – the saveloy. Best when eaten drunk with ketchup the saveloy is merely a hot dog by another name, around 12 inches long and thicker than the average dog and of course made of pork it is a rather bland tube meat but does the job of soaking up some beer. 4 Chips with Curry Sauce another treat to soak up the alcohol. Screaming hot chips with a creamy curry sauce slathered on top. So popular that you can now buy a myriad of curry sauce versions to make your own at home. This sauce probably first invited the English to try curries and thank god for their taste buds (well some of them) have evolved since that point. London. Liquor is said to be the traditional water in which jellied eels were cooked, parsley is then added and a greenish thin liquid is the result. This liquor is then poured over your mash and pie and seems to some to be quite enjoyable. I always thought it smelled funny and never tried it. 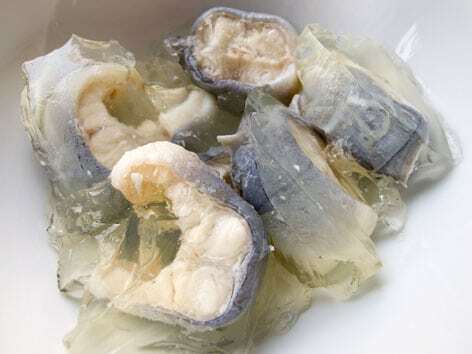 6 Jellied Eels – that, of course, brings me to jellied eels, one of the more historic English foods and it could truly be considered the national dish of England (if you live in the East end) – jellied eels are to me absolutely revolting. Chunks of silvery eel coated in slimy gelatin. In the 18th century, native eels were plentiful in the River Thames and estuary, and Dutch eel barges and fishmongers a common sight. One cheap and easy preparation, particularly among the East End working-class poor, was to chop the eels, boil them in herbs, and then allow them to cool; the eels would produce enough of their own gelatin so that a soft jelly would form around the pieces. (Today, a bit of gelatin is often added.) They say the taste is mild and salty but not fishy but you would have to get past the nasty look of them and all that jelly. 7 Winkles sigh…another East end favourite – tiny minute sea snails that you have to use a pin to dig out the meat and dip in hot butter or garlic mayonnaise. 8 Whelks are fat sea snails they’re cheap and lend themselves well to all sorts of flavours. Chefs these days are adding them to all kinds of seafood stir-fries and they are becoming very trendy in the upper echelons of British restaurants. 9 Cockles – a type of clam with the distinctive ridged shell you commonly see on British beaches. They are steamed like other clams and added to a dish or simply served with a dash of salt. Another of those traditional English foods that is seeing a return to favour with Chefs all over the country. 10 Black pudding, my husband’s favourite especially when served with a Full English breakfast, I have to say it does nothing for me. 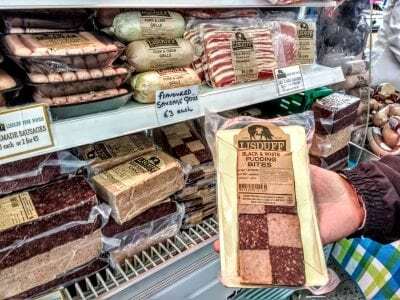 Blood sausage is exactly that – pig’s blood is collected, mixed with some herbs and a little oatmeal or binder pushed into a large sausage skin and served fried with breakfast. 11 White pudding or oatmeal pudding is another favourite. Like black pudding in size, it is a creamy white appearance but is made of pork meat and fat including lots of suet and oatmeal. Some areas have spiced it up with black pepper, and herbs but it still tastes like what it is sausage made out of fat. 12 Mushy and marrowfat peas oh I remember my Bachelor’s tinned peas with great fondness. I hated those fresh frozen green spring peas we got in Canada and vowed to never eat peas again. On my return to the UK, the first thing I bought was a tin of marrowfat peas. Marrowfats are green mature peas that have dried on the vine, it is a starchy kind of pea that is soaked overnight and then cooked with sugar, salt and a little bicarb of soda. They can be found dried in many Canadian grocery stores but here in the UK, there is always a quick cook canned kind that I remember fondly from my childhood. Marrowfats also make mushy peas that are the perfect side dish for fish and chips. 13 Battered sausages, it is what it is a cheap sausage; cooked, battered with the same stuff they use on the fish and then deep-fried. Not a particularly gourmet treat but cheap and available in every chippie anywhere in the British Isles. Here in England, there is a great fondness for battered and fried foods of any description from the famous fried Mars bars to everything in between. Another area of British foods that I just can’t get my teeth into. 14 Scotch Eggs my most favourite treat in the world. These days these things have gone right upmarket and are even sold in Harrods no less. A hard or semi-hard boiled egg (lovely when the yolk is runny) is coated in tasty sausage meat, then rolled in breadcrumbs or oatmeal and deep-fried till golden. A warm Scotch egg tastes like nothing else when that gorgeous orangey yolk bursts over your plate. A cold Scotch egg is the perfect picnic treat, or midnight snack oh hell anytime. 15 Toad in the Hole: Warning contains no toads and no holes unless you count the deep ditch in your pan of Yorkshire pudding that the sausages nestle in. I know I complained about battered sausages above but Yorkshire is not mere batter. Yorkshire is cooked in hot fat and roast juices and rises on the edges like a heavenly pillow. Served with good gravy, mash and cabbage – say no more. 16 Marmite spread a cracker spread like no other. Made from a yeast extract it is sticky, smelly and a dark brown a very distinct taste some have names umami. It is super salty and loads of vegetarians are using it these days as an ingredient, also note that the Australians have a version called Vegemite. Apparently, a “marmite” was a covered earthenware pot, my guess is that is what it used to be cooked in or was dumped in after the beer had finished brewing. 17 Piccalilli: I love that name so British. This is a mustard-based veggie pickle that if god forbid it doesn’t include cauliflower it is not authentic Piccalilli. It is sharp and mustardy and coloured with turmeric and it is the best pickle to have with pork pies and cold ham. 18 Branston Pickle is the best served with a Ploughman’s Lunch, good cheddar and thick slabs of ham. Branston is a pickled chutney based product that always includes swede (also known as a rutabaga), carrots, onions and cauliflower. The sauce is made from sugar, tomato, spices and vinegar. It is sweet and sticky and can be bought with a small chunk or a large chunk – heaven with a good cheese sandwich. 19 Pickled eggs are seen in every chippy that might indicate that they are good for those already pickled with alcohol (that’s the only time my hubs eats them). They are hardboiled eggs, pickled in brine or mainly in Malt vinegar with sugar, salt and occasionally some spices and herbs are added to gourmet them up a bit. My guess is that they used to preserve eggs this way centuries ago. 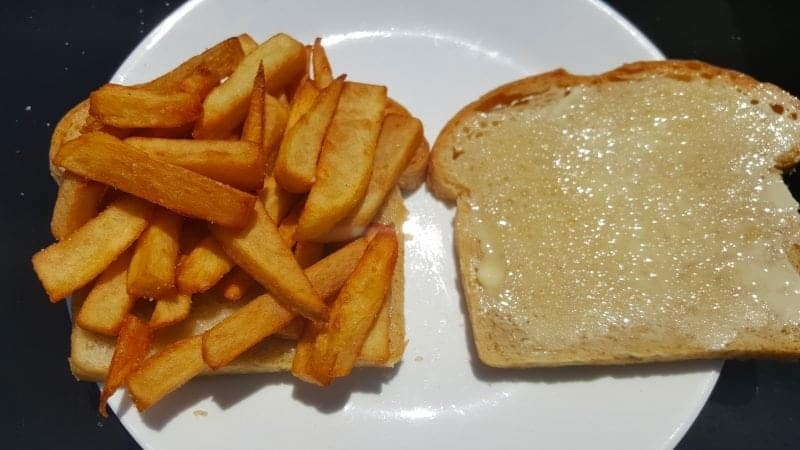 20 Chip butties, my favourite treat in the world, white bread just slathered with butter (Kerrygold Irish butter springs to mind here) then stuff with fresh crispy chips doused in malt and salt. The resulting mess is stuffed into your mouth and enjoyed for its pure and simple taste, nothing better. 21 Parmo, a very traditional Northern style treat after an evening drinking. The famous Teeside Parmo hails from Middlesborough is basically a chicken parmesan cutlet served in a box with chips. Nothing unusual in that, but apparently was brought to the area by an American serviceman who stayed in the UK after WWII. Apparently, the Grand Central Food Bazaar does a primo one as well. I should definitely mention that some of the best Food Halls I have ever visited with a superb selection of products to enjoy are available in London- foodies should all visit at least once in their lives. If you want to taste some of these traditional English food favourites you should head to Leather Lane Market or Borough market for some truly great British food. Do you have a favourite British food? I love hearing about unique foods! This was particularly fun to read for me because I have so many English friends. Have to admit though, “bloater paste” is a very funny name hahaha. i’ve had many nights of chips and curry sauce around the world! what an interesting list of food…going to have to try some more. This article was so interesting and informative! I was aware of only a few on the list and it’s always enlightening to see other culture’s cuisines. Coming from a Moldovan background, I can relate to having some favorites that might seem questionable to others, especially not knowing what it is. Great post! LOL you are so right. Well sarnie is short for a sandwich and bloater is a type of fish, not a bad tasting one either it is just very ugly so used to be made into fish type stuff like fishfingers and so on because no one wanted to eat such an ugly thing. Learning of the food around the world sounds interesting. We had never heard about the pickled eggs. We would love to try some of these items in post. Good to know this list as i never really encountered most of these food before and only tried 2 in your list. I am sure i am curious right now to try the rest. Paste? Jellied eels?! I’m not sure I’m brave enough to try any of these! Well… curry and chips… but not sure about the others! We get Branston pickle in Australia too. It’s pretty common and I love it! I think I’ll give the black pudding a miss. Interesting! I’ve been seeing some of these in the supermarkets and this post guided me on what those are. I’ve always been curious about toad in a hole. Lol. 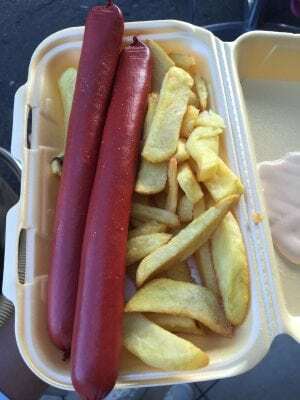 Nothing beats a saveloy and chips! I do love a scotch egg too and stopped being a vegetarian just so I could return to my childhood favourite – Toad in the hole! I love English food and love heading to a traditional, British pub! As a fellow English person I know most of these but I’m northern so some of the southern ones are alien to me – chips and curry? I think you meant to pick chips and gravy! Haha. Can’t beat a black pudding though 🙂 Lovely funny post. LOL I did not realize that curry sauce was a Southern thing. You can even buy an instant Bisto mix for Chip Shop Curry Sauce down in the south.